Facebook Gifting plus a whole lot more. These are intended to provide an easy way to invite Facebook friends who have not tried Sherwood. Once sent, invites are visible on the Facebook News Feed. It's a tool to help you grow the game. If you enjoy Sherwood Dungeon, let the world know! If you want to stay in touch outside the game, you can use this to send a Facebook friend request to players in your Sherwood Dungeon friends list. Facebook messages can be sent to players in your friends list. With the popularity of Facebook mobile phone apps you can reach out to Sherwood friends anywhere, even when they are not at their computers. If you need reinforcements for a surprise raid or want a friend to meet you in the game, the messaging feature can come in handy. This is a very cool new feature launched on April 7, 2014. Any weapon, shield, ring or amulet can now be sent as a gift to players in your friends list. If they are online and popups are enabled in the options panel, the gift is sent instantly. 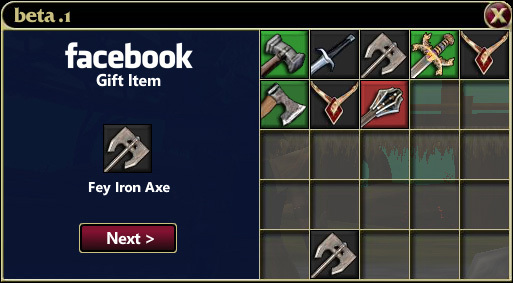 Otherwise the gift will be waiting for the next time they log in. This allows you to create Facebook events, useful for organizing meeting times for tournaments, clan meetings or socials within the game. Facebook sends out reminders for the events automatically and allows you to manage the invite list. As these feature are social, they will only become truly useful once the other players on your friends list also begin using them. A certain level of critical mass will be necessary, so encourage others on your friends list to connect Sherwood to Facebook. Popups need to be enabled in your web browser to see the Facebook login and permissions window. With 60,000 Facebook fans on our Sherwood page, there is clearly players using Facebook. My intention was to leverage as many Facebook features as possible to keep the Sherwood community strong both inside and outside the game. These new social features can help bridge the gap between the connections we make inside the game and the friendships we have in the real world. "The dream of MaidMarian.com is to create an online escape into Sherwood Forest bringing together an online community of like-minded players. I hope to push the envelope both through technology and visually so this 'experiment' continues to represent the state of the art and revolutionizes the way massively multiplayer games are delivered. The unique independent nature of this project allows a more open development process so you can participate in it's growth through your feedback. The Developer's Diary is where I keep you up to date on the changes and the challenges I'm facing. Feel free to contact me with suggestions and encouragement by email."